Are files needed by customers, employees, auditors, the public, attorneys, and others that are difficult - or even impossible - to find? Are restricted records such as personnel files or protected health information shielded from unauthorized viewing? How long does it take to find and pull inactive records? Are you running a risk of injury just to find a box? Do you miss deadlines with customers or auditors because you can't locate a file? The cost of storing your records is much more than the space it takes up. Even inactive records should be accessible when the need arises. The cost of access is a major factor to consider when considering the cost of a records program. Not only do you have to pay an employee to find the inactive file, but you lose what that employee or employees could be doing for you instead of looking for the needed file. 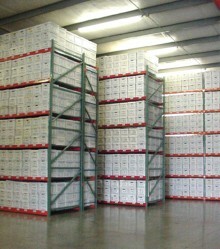 Another factor of accessibility is where and how the records are stored and inventoried. When a request is made, how do you identify the box you need and where it is located? Do you have to look through many boxes to find what you need? Are the boxes labeled so that you can easily identify what is in a box? How heavy are the boxes that need to be moved to get to the file you need? Is the area you are looking in clean? Are there bugs, spider or even mice in the area? In essence, all of these questions can boil down to one question: do the people that have to find a file when needed dread that assignment more than anything? Records Management Services offers you a way to answer all of these questions positively. With RMS, your records are just a phone call away. We offer computerized inventory as well as functional searches that allow us to pinpoint a box with very little information. Once a box is found in our system, a ticket is generated that shows the box number (bar coded for accuracy), along with the location for that box (again, bar coded for accuracy). Once the file is pulled, it is ready for you to come view it or we can deliver it right to your desk! With Records Management Services, you don't have to get sweaty or dirty, or even risk injury, just to retrieve a box.